The VPAP Auto 25 is a compact bilevel device designed to deliver effective therapy as naturally and comfortably as possible. 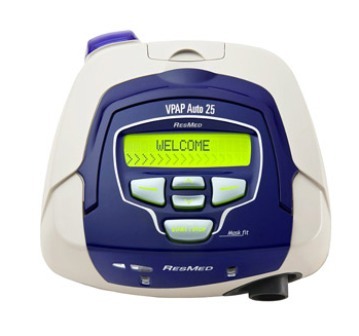 The VPAP Auto 25 combines proven AutoSet algorithm with the supreme comfort of ResMed's Easy-Breath technology to make breathing easier for people with obstructive sleep apnea. The system is exceptionally compact and convenient, and out-performs bulky products offered by competitors. VPAP Auto 25 is ideal for travel or home use. 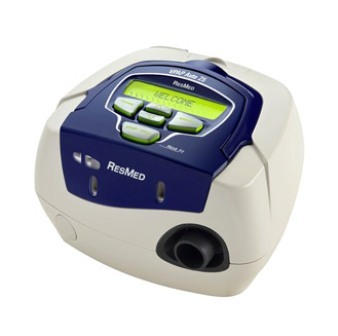 Featuring Easy-Breathe, ResMed™s new comfort technology, VPAP Auto 25 offers nearly silent therapy and greater pressure stability so users sleep comfortably throughout the night. VPAP Auto 25 uses Easy-Breathe pressure delivery and synchronizes with the user™s normal respiration so that breathing feels more natural and comfortable. Data Storage Includes usage, leak, pressure, AHI, AI, tidal volume, respiratory rate, and minute ventilation.